Sorry, I don't think I'll add any more feature in version 6.0 now. I already sent translation requests to our very kind translators, therefore the user interface can't change anymore except for major design flaws. The software I inspire myself from (OmniGraffle and Word) use alignment rule on the first selected object. Even if your use case is a good one, the current behavior is handy in other cases too. I'm quite new to SH3D, and with the exception from one feature, it's in my opionen the perfect solution to get a draft from your home - A "Profil View" with measurements. My Goal is to get an offer from different construction companies for my House, but therefore I not only need the ground plan/view with the dimensions/measurements, they also request a so called "Profile View" from he building. Up to now I wasn't able to get this out of the default view and wasn't able to find a tip or an other valid workaround. Thus I would higly recommend a this feature. As far as my java knowledge reach, there is already a method to get every "Wall-Object" on a line. So it would be sufficient that you can define a point A and a point B in the "Home Plan" View. The line (or more like a slice thats generated) collects the different informations of the objects it's meeting and displays it. After that one can add the measurements via the "usual" measurement tool. I even wouldn't mind if the Profil View has to be updated manually. If anyone needs further explanation or if the description is to short, just let me know, I will gladly write more. Thank you all in advanced and also lots of thanks for the already great solution! 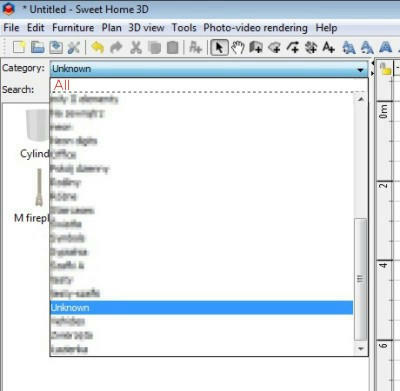 SH3D is primarily an interior design application and therefore you can not find this feature. thanks for your quick reply - I would be surprised if nobody ever suggested this, unfortunately I wasn't able to find the Threads/Ticket due to wrong key words I searched for. As far as I'm concerned, a side view would be sufficient for the first step. In the Feature Request #484 side view is also asked for tools to document wiring, pipes, etc.